The Significance of Statistical Significance? Here is this Friday’s installment of Avoiding Investment Strategy Flame-outs, a short book we are previewing for subscribers. With this post, the book preview is complete. “Section 8-2 examines in detail the attractiveness of a short-term trading strategy offered in the quasi-advisory (“educational”) marketplace. Assessing this strategy entails considerable work, only to find that it is not attractive. This chapter covers more broadly the delegation of investment strategy development, ranging from following an expert’s public advice on market timing to deposit of funds for professional management. Such practices relieve investors (at a cost) of some or all of the burdens of learning, data collection/analysis, strategy design and disciplined implementation. Media that present investing advice want subscription fees or attention to advertisements. Media company interest in the usefulness of what they present is arguably secondary to attracting attention. In general, contributors to free media also have motives that bias what they present (attracting their own subscribers or clients). Academics studying financial markets want employment (and tenure) and funding of future research. They therefore must attract the attention of peers and publishers. They often have no stake in whether their research findings are useful to investors. They do have an incentive to attract the attention of investors when making a transition to investment management. Expert equity analysts want employment by brokers and asset managers, and access to industry sources. The interests of their bosses may not always coincide with the interests of the clients of their bosses or other investors. Newsletter sellers want subscription fees. Getting the attention of potential subscribers is essential to their business model. They sometimes seek attention by uncritically presenting snooped, gross trading system results as an “educational” service. Financial advisors want advisory fees. They must attract the attention of potential clients. As with newsletter sellers, the font used for marketing copy is much larger than that used for the legal disclaimer. Investment managers, mutual fund managers and hedge fund managers want management fees, normally as a percentage of account balance. They have to get the account before they can debit the balance. They have to get the attention of a potential clients before they get the account. “A common motive across the range of investment service providers is attention-seeking, which tends to drive offerors toward extreme representations (possible but low-probability scenarios, the tails of the distribution of potential outcomes). The most extreme representations offer the “holy grail” of amazingly large and reliable returns (appealing to investor greed) or the “safety of Noah’s ark” from impending doom (appealing to investor fear). Here is this Friday’s installment of Avoiding Investment Strategy Flame-outs, a short book we are previewing for subscribers. Chapter previews will continue for one more Friday. “This chapter steps through two analysis regimes via examples to illustrate avoidance and mitigation of the issues covered in Chapters 1 through 6. The first example involves a widely used technical indicator, the 10-month simple moving average, but with an investigation of whether there is more information in the average than conventionally extracted. The second example constructs in detail a portfolio-level view of a short-term trading strategy offered in the quasi-advisory (“educational”) marketplace. The purpose of the examples is to illustrate different ways that most investors can use to analyze investment strategies. Here is this Friday’s installment of Avoiding Investment Strategy Flame-outs, a short book we are previewing for subscribers. Chapter previews will continue for the next two Fridays. “To the extent that governments tax different kinds of income/investment returns (interest, dividends, long-term capital gains and short-term capital gains) differently, taxes may be decisive for some individuals in designing a strategy or selecting one strategy over another. What is the investor’s expected marginal tax rate? Does the investor have any capital losses carried forward from prior years that may offset future gains? Are the funds in a tax-advantaged account, such as (in the U.S.): a conventional Individual Retirement Account (IRA), subject to tax rates at the time of withdrawal (whatever they may be); or, a Roth IRA, subject to no taxes at withdrawal (as the rules stand now)? “An obvious risk to long-term strategies including assumptions about taxes is that governments may change the rules at any time. Here is this Friday’s installment of Avoiding Investment Strategy Flame-outs, a short book we are previewing for subscribers. Chapter previews will continue for the next three Fridays. “Evaluating strategies based only on trade-level performance, as often presented by trading advisory (“education”) services, may mislead. Some strategies concentrate opportunities, at times identifying more trades than can reasonably be addressed with a limited amount of capital and at other times identifying no trades. “Moreover, evaluating strategies based only on a list of closed trades, with the performance of contemporaneous open trades unknown, may mislead because open trades may be losers that at times absorb all the capital and preclude further trading. Here is this Friday’s installment of Avoiding Investment Strategy Flame-outs, a short book we are previewing for subscribers. Chapter previews will continue for the next four Fridays. “The market is a complex system with many interacting parts, and external influences. As in other social settings, there are two aspects to market evolution: (1) adaptation to changes in external influences; and, (2) adaptation to adjust internal imbalances. Economic globalization broadens the universe of assets available in the market, but tends to increase co-movement of assets. Political shifts may favor one industry over another or affect portfolio-level after-tax profitability of investing. Loose monetary policy may favor the financial industry. Regulatory actions on broker fees, quote granularity, short selling and margin levels impact investment frictions (profitability of trading) and cash requirements (portfolio-level returns). Mass availability of historical data and investing knowledge, computing power, analysis software and real-time trading accelerate market identification of and response to all market opportunities. “Investor adaptation to such influences is generally strategic. Here is this Friday’s installment of Avoiding Investment Strategy Flame-outs, a short book we are previewing for subscribers. Chapter previews will continue for the next five Fridays. “Investment frictions (costs) include such burdens as broker transaction fee, bid-ask spread, impact of trading (for large trades), borrowing cost for shorting, cost of leverage, costs of data, software and hardware for research, fund loads, cost of advisory services and cost of an investment manager. “Transaction fees vary by broker. “Transaction fees are generally higher percentage-wise for small trades than large trades, and therefore for investors with small accounts than those with large accounts. Sophisticated traders may be able to suppress frictions via broker arrangements and order placement algorithms. “Market liquidity tends to be lower in emerging markets than developed markets, generally indicating higher bid-ask spreads and impacts of trading in emerging markets. “Both transaction fees and bid-ask spreads were generally much higher in past decades than now due to regulatory changes (ending of fixed commissions and decimalization) and technological advances (lower cost of execution and lower barrier to entry for discount brokers). This variation is problematic for long backtests. “Frictions are generally higher percentage-wise for option trades than equity trades of similar sizes. Frictions for futures trades are comparatively low. “Frictions for aesthetic assets such as art and wine are very large compared to those for financial assets. “Cost of an investment manager subsumes the other costs (perhaps with economies of scale) but adds incremental fees for administration and management. Here is this Friday’s installment of Avoiding Investment Strategy Flame-outs, a short book we are previewing for subscribers. Chapter previews will continue for the next six Fridays. “A sentiment shared among researchers in stochastic fields is: “If you torture the data long enough, it will confess to anything.” Because returns are noisy (substantially random), trying many combinations of rules, parameter settings and data samples will generate strategies that outperform benchmarks by extreme good luck. A prosecutor (an investor) satisfied with false confessions is likely to lose in court (the market). 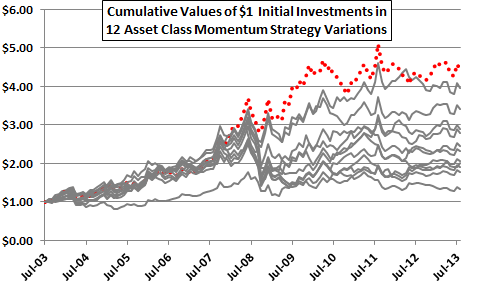 “To illustrate, Figure 3-0 depicts the net cumulative values of $1.00 initial investments in each of 12 variations of the simple asset class momentum strategy introduced in Figure 1-1. This strategy shifts each month to the one of nine asset class proxies with the highest total return over a past return measurement (ranking) interval. Most of the proxies are exchange-traded funds (ETF). The 12 variations differ by the length of the ranking interval, from one to 12 months. All variations impose a switching friction of 0.25% whenever the strategy switches funds.